God said this in quran. Then He turned to the heaven when it was smoke...(The Noble Quran, 41:11)"
"When the sky disintegrates, and turns rose colored like paint. 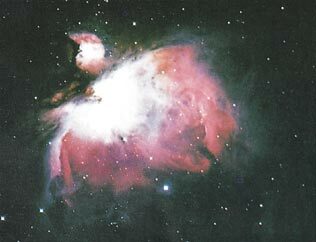 - (The Noble Quran, 55:37)"
What Allah Almighty is Saying here is that when Galaxies explode, they form a rose-shaped explosion. He is also telling us that the Universe will all turn into exploded galaxies looking like roses when the Day of Judgment happens. The Day that We roll up the heavens like a scroll rolled up for books (completed),- even as We produced the first creation, so shall We produce a new one: a promise We have undertaken: truly shall We fulfill it. 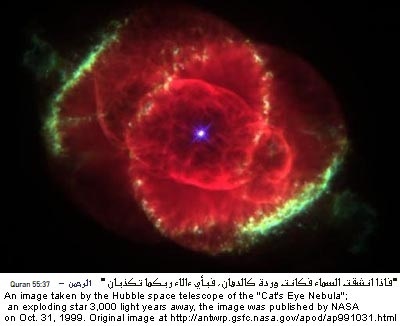 (The Noble Quran, 21:104)"
NASA's discovery only 8 years ago! The following link and quote were sent to me by brother Usman; may Allah Almighty always be pleased with him. Since the Moon revolves around the Sun together with the Earth, it follows a path through space which resembles the letter â€œS.â€? The appearance of this orbit resembles the twisted shape of a dry date branch, as is revealed in the Qurâ€™an. The verse refers once more to the dogmatic disbelievers blind to these marvels. All these formations in the atmosphere show the design behind them, namely, the creation and perpetuation of life. The approximate temperature in space is -270 degrees Celsius. Our earth is protected against this cold thanks to the atmosphere. The atmosphere prevents the energy directed to the earth from going back to space. The atmosphere arranges an even distribution of heat on earth by meteorological phenomena. A hot air mass is thus carried to parts less warm in the atmosphere, establishing a balance between the overheated equatorial and the cold polar regions. Protection from the lethal cold and heat is secured thanks to the perfect design of the atmosphere. The Arabic word â€œsemaâ€? (meaning sky, heaven in addition to its signification of atmosphere) may have the connotation of the entirety of space and the phenomena taking place in it, as well. 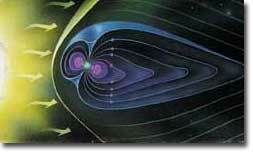 The Van Allen belts protect us against radiation bombardment. Had it not been for this, life on earth would have been impossible. The lethal cosmic rays coming from the stars other than the sun cannot penetrate this shield. These plasma clouds can reach 100 billion-fold the value of the atom bomb dropped over Hiroshima. Thanks to the Van Allen belts at a distance of 60,000 km from the world, the solar winds cannot penetrate the earth we live in. The â€œWell protected roofâ€? in the verse 21:32 was the result of the speed of rotation of our world, its position in relation to the sun, the structure, the shape and thickness of atmospheric layers, the structure of the core of the earth, the proportion of the constituents in its composition and the perfect and harmonious combinations of a multitude of parameters have made this possible. The Author of all these prerequisites for our life cannot be other than the Creator Himself. Logic and conscience cannot accept that all these protective measures in the sky have come about fortuitously and that the Quran was the product of a human intellect and genius. Modern earth sciences have proven that mountains have deep roots under the surface of the ground (see figure 9) and that these roots can reach several times their elevations above the surface of the ground.2 So the most suitable word to describe mountains on the basis of this information is the word â€?peg,â€™ since most of a properly set peg is hidden under the surface of the ground. The history of science tells us that the theory of mountains having deep roots was introduced only in the latter half of the nineteenth century. Modern science has discovered that in estuaries, where fresh (sweet) and salt water meet, the situation is somewhat different from what is found in places where two seas meet. 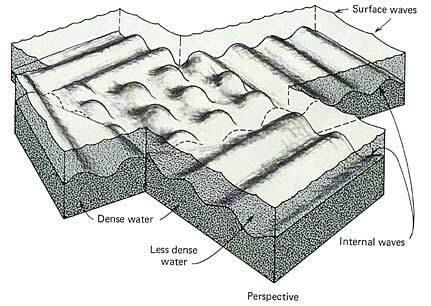 It has been discovered that what distinguishes fresh water from salt water in estuaries is a â€œpycnocline zone with a marked density discontinuity separating the two layers.â€?3 This partition (zone of separation) has a different salinity from the fresh water and from the salt water4 (see figure 14). We can also understand from the following sentences in the previous verse, â€œ...in a deep sea. It is covered by waves, above which are waves, above which are clouds....â€?, that the deep waters of seas and oceans are covered by waves, and above these waves are other waves. It is clear that the second set of waves are the surface waves that we see, because the verse mentions that above the second waves there are clouds. But what about the first waves? 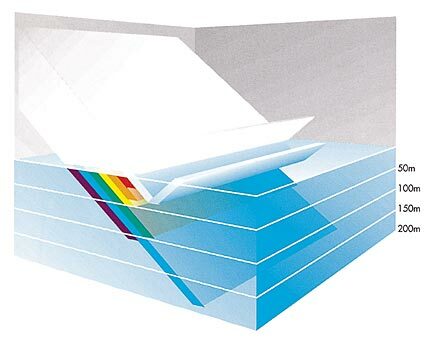 Scientists have recently discovered that there are internal waves which â€œoccur on density interfaces between layers of different densities.â€?2 (see figure 16). "We will show them Our signs in the Universe and inside their selves, until it will become quite clear to them that it is the truth. Is it not sufficient as regards your Lord that He is a witness over all things? (The Noble Quran, 41:53)"
The next stage mentioned in the verse is the mudghah stage. The Arabic word mudghah means â€œchewed substance.â€? 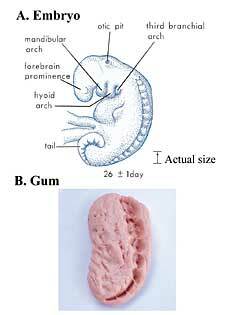 If one were to take a piece of gum and chew it in his or her mouth and then compare it with an embryo at the mudghah stage, we would conclude that the embryo at the mudghah stage acquires the appearance of a chewed substance. This is because of the somites at the back of the embryo that â€œsomewhat resemble teethmarks in a chewed substance.â€?6 (see figures 5 and 6). 53- And has sent down water from the sky. With it have We produced diverse pairs of plants. 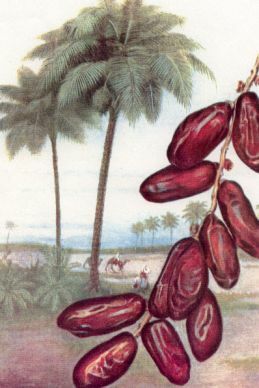 3- ...And fruit of every kind He made in pairs two and two. 3- Does the human being think that We cannot assemble his bones? 4- Surely, We are able to reconstruct even his fingertips. 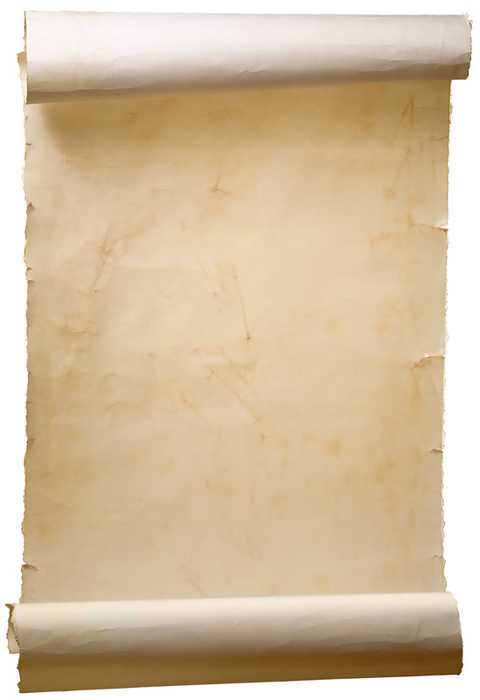 Fingerprints did not mean much to the people at the Prophetâ€™s time. An Englishman by the name of Genn Ginsen, in 1856, found out that the pattern of lines at the tip of a personâ€™s finger was something unique to the individual. Until 1856, men knew nothing about this characteristic of fingertips. The discovery of the fact that the pattern of lines on fingertips was a sort of identity card is often used by the police to help find criminals. The pattern lines of the fingertips differ even in identical twins. This identity card cannot be forged; it affixes a unique signature to whatever it touches. One cannot imitate or deny it. We carry it about us till the end of our days. Epidermal burns or injuries or aging distort our bodies in one way or another, yet cannot change this fact. These patterns of lines are traced within the womb when the fetus completes its three monthsâ€™ period. Research is currently being carried out to see whether these lines may be used to detect genetic defects in our body. To the best of our knowledge so far, nothing positive has been discovered on this issue. It is, however, likely that something new may emerge any day. At the time of the descent of the Quran, fingertips had nothing special about them. God, who will cause man to come back to life on the Day of Judgment, stresses the importance of fingertips. One of the basic indications of this verse may refer to the patterns of lines on manâ€™s fingertips. There may be other indications, according to which all the characteristics of our body are encoded on our fingertips. It could be implied that during our re-creation all the particularities and features of our body will be restored, so it may be that what lies on our fingertips, apparently of little significance, will be sufficient for this process. The reason why fingertips are given as example is the general acceptance that they are simple things of not much worth. Nevertheless, even the seemingly insignificant tip of a finger is a data bank, thanks to which the entire body may be re-fashioned. DNA is one of the most important discoveries in human history. The discovery of DNA put an end to the idea that the human cell had a simple structure with its contents. As the cell came to be analyzed more and more, the complexity of its makeup was better understood. Even one piece of DNA includes a cipher formed of a series of more than three billion codes. From the color of our hair to our little finger, everything is contained in this code. A printout of data related to DNA would form the contents of about 1000 volumes of one million pages. What is more, DNA has the capacity to duplicate all these data within 20 to 80 minutes. In the lore contained in the 1000 volumes of one single DNA, one can find all the characteristics of the body. The DNA of a simple cell on the fingertip will give one all the necessary information. Our Creator can easily have recourse to this lore to re-create man. It would be as easy for Him to do so as if He were creating him for the first time. 78- And he makes comparisons for Us and forgets his own creation. He says â€œWho can resurrect the bones after they are rotten?â€? 79- Say â€œHe who created them the first time. He has knowledge of every creation.â€? The dead turning into Fossils and Iron. The Noble Quran Claimed it, and Science today Confirmed it! They also say, "After we shall have become bones and dust, shall we in sooth be raised a new creation?" SAY: "Yes, though ye were STONES, or IRON, or any other creature, to your seeming, yet harder to be raised." But they will say, "Who shall bring us back?" SAY: "He who created you at first." And they will wag their heads at thee, and say, "When shall this be?" SAY: "Haply it is nigh." (The Noble Quran, 17:49-51)"
Note: Formerly all minerals were called fossils, but the word is now restricted to express the remains of animals and plants found buried in the earth. --Ure. 2. (Paleon.) The remains of an animal or plant found in stratified ROCKS. Most fossils belong to extinct species, but many of the later ones belong to species still living. 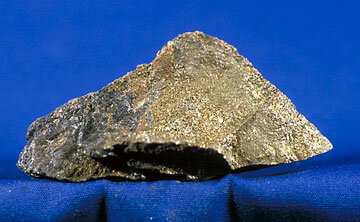 The mineral iron pyrite, FeS2, can occur in igneous, metamorphic and sedimentary rocks. It is often found in fossil shells, and can become a problem in museum collections because it may React with oxygen and water to form compounds that may destroy the specimen. 22- And We send the fecundating winds. Before rising to the upper layers of the atmosphere, the gaseous suspension of ultramicroscopic particles of a liquid called aerosol, generated by foaming in seas and other waters, gets mixed with the dust that the winds sweep from the lands. These particles combine with water vapor that condenses around these particles. Had it not been for these particles, one hundred per cent water vapor could not form the cloud. The formation of clouds is the consequence of the windsâ€™ formation of the water vapor in suspension with the fecundating particles they carry. Had the winds failed to perform this duty there would not have been any rain clouds. As there would be no rain, life could not thrive upon the earth. However, winds have other functions as well. Why did the Quran describe the front of the head as being lying and sinful? Why didnâ€™t the Quran say that the person was lying and sinful? What is the relationship between the front of the head and lying and sinfulness? 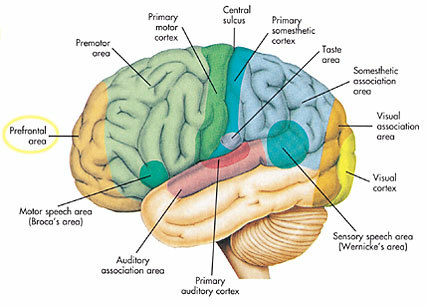 If we look into the skull at the front of the head, we will find the prefrontal area of the cerebrum (see figure 12). What does physiology tell us about the function of this area? A book entitled Essentials of Anatomy & Physiology says about this area, â€œThe motivation and the foresight to plan and initiate movements occur in the anterior portion of the frontal lobes, the prefrontal area. This is a region of association cortex...â€?1 Also the book says, â€œIn relation to its involvement in motivation, the prefrontal area is also thought to be the functional center for aggression....â€? So, this area of the cerebrum is responsible for planning, motivating, and initiating good and sinful behavior and is responsible for the telling of lies and the speaking of truth. Thus, it is proper to describe the front of the head as lying and sinful when someone lies or commits a sin, as the Quran has said, â€œ...A lying, sinful naseyah (front of the head)!â€? (3) Al-Eâ€™jaz al-Elmy fee al-Naseyah (The Scientific Miracles in the Front of the Head), Moore and others, p. 41. 1- Burns of first degree (sun burns): these affect the epidermis causing swelling and moderate pain. The phenomena of redness, swelling and pain usually disappear within two to three days. (Figure 1). 2- Burns of second degree: epidermis and dermis are injured. In such a case, a detachment occurs between epidermis and dermis, causing the collection of secretions between these two layers (Figure 2). The injured person suffers from severe pain, and excessive increase of pain sensation, due to irritation of exposed nerve ending particularly after the outburst of blisters. The skin starts to heal within 14 days as a result of the process of renovation and inversion under the skin. 3- Burns of third degree: the whole skin thickness is burned and perhaps the injury may reach the muscles or the bone. The skin loses elasticity and becomes rough and dry. In this case, the injured person do not feel much pain, as nerve endings have been damaged almost completely due to burning (Figure 3). Allah did not say â€œas often as their skins are burnedâ€?, as burning could be partial, but He rather said: â€œas often as their skins are roasted throughâ€?, i.e., totally burned with all nerves of sensation and pain. So, He the Almighty associated between the sensation of pain and the skin when roasted and burned totally, thus losing its structure and function. When sensation of pain is lost, a new fully composed and functional skin is replaced, where the nerve ending responsible for the painful sensation of heat and burn perform and function to make the unbeliever taste the punishment of being burned with fire over and over again. Narrated Abdullah: Allah's Apostle Muhammed, the true and truly inspired said:, "(as regards your creation), every one of you is collected in the womb of his mother for the first forty days, and then he becomes a clot for an other forty days, and then a piece of flesh for an other forty days. Then Allah sends an angel to write four words: He writes his deeds, time of his death, means of his livelihood, and whether he will be wretched or blessed (in religion). Then the soul is breathed into his body...(Sahih Al-Bukhari, Volume 4, Book 55, Number 549)"
40+40+40=120 days baby becomes alive. "Week 18: Tiny air sacs called alveoli begin to form in lungs and the vocal chords are formed. Baby goes through the motions of crying but without air doesn't make a sound; yet. "Week 18: Your baby is approximately 6 inches/ 14.2 centimetres long from crown to rump and she weighs about 7 ounces/ 190 grams. Her chest moves up and down to mimic breathing but she's not taking in air, only amniotic fluid"
Exactly after 120 days as the hadiths state! The lanugo covers the entire body. Eyebrows, eyelashes, fingernails, and toenails appear. 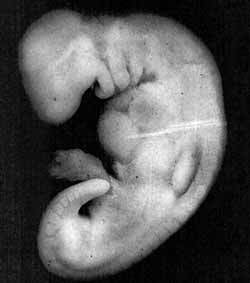 The fetus has increased muscle development. Alveoli (air sacs) are forming in lungs. The nervous system develops enough to control some body functions. The cochlea are now developed, though the myelin sheaths in the neural portion of the auditory system will continue to develop until 18 months after birth. The respiratory system has developed to the point where gas exchange is possible. Narrated Abu Huraira: "The Prophet Muhammed said "If a house fly falls in the drink of anyone of you, he should dip it (in the drink), for one of its wings has a disease and the other has the cure for the disease." (Translation of Sahih Bukhari, Volume 4, Book 54, Number 537)"
Let me ask you something: if any of these things were later revealed by science not to be true, would that be cause to you for disbelieving in Islam? no, beacuse as you can see every scientific verse and hadith modern science confirms totally. that is why i posted them here. But if they weren't to confirm it--if they said the opposite of what the Koran said instead--would you consider that grounds for apostasy? Then why consider it a confirmation of faith when they do agree? "i belive in Allah without any evidence"
if sceince facts said different than quran, like if quran said that earth is flat and have 4 corners and if you go to the end of the world you could fall, if i red such thing in quran i would not believe in quran beacuse God does not make error. People , Islam is evidence and then believe, not blindly belief. why is it my brother? is it beacuse you dont know scientific facts in quran, brother i have studied science in quran and modern science for many years, there is none single false scientific statement in quran, so dont worry, i know what i am talkning about. brother , you always need proof, and there is much proof in science that God exists, you should not be scared of science. Nice post andalusi thanks for sharing and the pictures were really helpful. There is much in the quran to prove there is God. God gave us a brain to use and so we should increase our knowledge and of course the quran is the best source of knowledge. come from the ears (ear cells). Yes, I think cloning etc is pretty disgusting. But the justification for it is that it is only replicating what nature does anyway. In other words, natural selction can be made to be 'unnatural selection'. That is that creatures (or plants) are bred SELECTIVELY, i.e. to produce certain charactersitics. 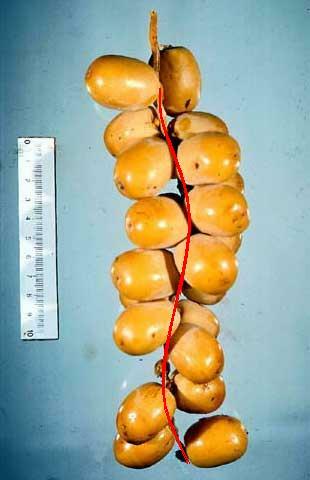 This technique is well known with certainvarieties of plants and particularly noticable with dog breeding: ie. totally unatural breeds of dogs are produced through certain breeding techniques. I'd call it sick science myself. 1) "The Qu'ran is right about some things, so it must be right about ev erything!". Nonsense. The Lord of the Rings is right about the fact swords exist, that doesn't mean Sauron exists. Also, can he show that the 80% of the Qu'ran he claims is correct is actually correct? I doubt it. 2) One logical reason robbing is bad? Because it harms society, it has a negative impact on another individual. If he wants a reason why it's bad for him? Well, it harms a society that he's part of. Ultimately, he's done nothing to prove the existence of Allah, or the existence of life after death. tell me, how could muhammed who was illiterate man or anybody else know about Big bang and expansion of universe in 6th century in desert? They did not have telescopes to see in universe and discover like Eistein and Edwin Hubble could ? Who told muhammed this scientific facts in Quran? this is evidence for all of us that QUran is indeed from God, this is proof that you can believe that God exists and that quran is his book. 41:53 We will soon show them Our signs in the Universe and in their own souls, until it will become quite clear to them that it is the truth. Is it not sufficient as regards your Lord that He is a witness over all things? When God talks about big bang and expansion of universe in quran , and our scientists discover this stuff, this is how God shows His signs to us so we can believe in his Book Quran. he does not care if he harms society, beacuse he get easy money and gold, he enjoy life. It's easy to interpret as scientific knowledge after the fact. Show me where in the Qu'ran it links quantum physics with the theory of relativity, and I might be impressed. Loosely interpreting something to mean somethong after it's discovered is intellectually dishonest. Use the Qu'ran to make a discovery, if it's so full of scientific knowledge. Ok, so he has money. Meanwhile, the person he stole it from picks up a gun and goes out to get revenge, unable to kill him, decides to kill his family. Suddenly, he's not so happy anymore. See? It's not as simple as "He stole money, he's happy." Also, what part of "If he wants a reason why it's bad for him? Well, it harms a society that he's part of." did you fail to understand? If everyone was stealing from everyone, society would collapse.